Combined with $15 million for a parking garage that Hamilton County commissioners are likely to commit to at their Wednesday meeting, the city and the county are willing to spend $52 million on the project. FC Cincinnati says its investors will spend the $200 million they say it will take to build a 21,000-seat soccer-specific. They went to local government to find the money for the infrastructure funding of widening roads, providing parking and preparing the site. Even that $52 million is not likely to be enough. 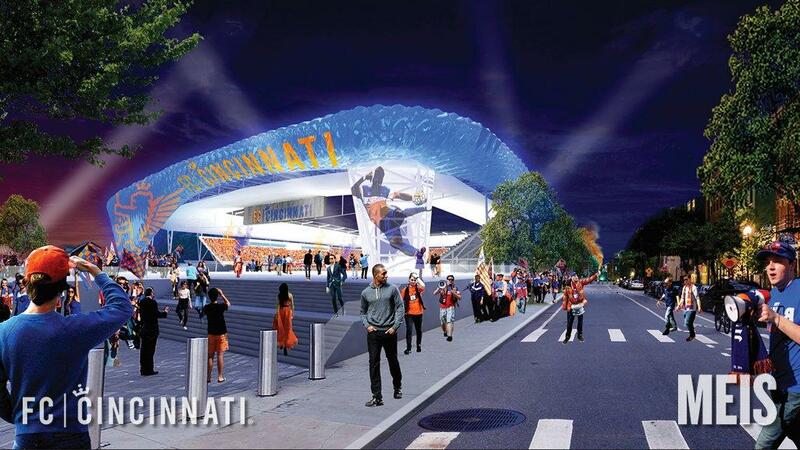 FC Cincinnati has said it needs about $75 million in government help. In a special meeting of council's Budget and Finance Committee, eight council members spent nearly four-and-a-half hours hearing from the public, FC Cincinnati, city administration officials and arguing among themselves over the wisdom of committing that much money to a Major League Soccer franchise that may not be awarded to Cincinnati. "It may be a moot point because Major League Soccer can say no," says Council member Kevin Flynn, who voted for the infrastructure package. Flynn was joined by Vice Mayor David Mann, committee chairman Charlie Winburn and council members Christopher Smitherman and Amy Murray in voting for the package. Council members P.G. Sittenfeld and Chris Seelbach voted no, while council member Yvette Simpson, who was defeated earlier this month in a bid for mayor, abstained. What the council committee passed Monday is a slightly revised version of the financing package Mayor John Cranley rolled out after his successful re-election campaign. The formal vote will take place at Wednesday's weekly council meeting, but the majority votes on the nine-member council to pass it are clearly in place. The money will use a combination of sources including tax increment financing (TIF), asking Hamilton County for the portion of the hotel tax levied in the city, money set aside earlier from selling the Blue Ash Airport and $2.5 million from the city's 2019 capital improvements budget. FC Cincinnati appears to be in competition with Nashville and Sacramento for the next new Major League Soccer franchises. A decision is expected in December. Cranley, who is not a voting member of council, appeared briefly in the council chambers to make a statement supporting the plan and read a letter from his predecessor, Mark Mallory, urging council to vote for the infrastructure money. "We didn't set the timeline for this; Major League Soccer did," Cranley says. "This will be viewed as a classic no-brainer. This is not a close call." The mayor says he's already talking to businesses that may want to locate near the soccer stadium. "I promise you we will be announcing thousands of new jobs," Cranley says. Cranley left the meeting after his remarks without taking questions from council members. Jeff Capell, chairman of No More Stadium Taxes, a grassroots group, calls the FC Cincinnati negotiations with the city and county "a sham process." "Suddenly, after the election, this becomes priority number one for city council," Capell says. "If there is a time crisis, it is a crisis of their own making." No one in the city administration nor FC Cincinnati president and CEO Jeff Berding, a former city council member, could come up with an answer for council members who wanted to know how the $23 million gap between what FC Cincinnati wants for infrastructure and what city and county government is giving will be filled. "There is a level of uncertainty about where the money will come from," Berding says. Berding suggests if the Oakley location doesn't work out, the club may look elsewhere, such as the city's West End neighborhood. In the past, FC Cincinnati has mentioned Newport as an alternative. Seelbach said he believes there is irony in the fact that three council members who call themselves "fiscal conservatives" - Winburn, Smitherman and Murray - were supporting a plan where the numbers don't add up. Winburn says he doesn't see the gap as a problem. "We're going to be playing in the major leagues," Winburn says. "And sometimes you don't have everything nailed down."